Our glass and plastic square bottles could bring a new level of design and variety to your product line. Square bottles provide design friendly panels for labeling and decoration, and are composed of materials that are ideal for use with an array of goods. SKS has square glass bottles in various sizes of the following styles: French square, Marasca, and Perfume Sample bottles. For many reasons, glass is considered one of the top materials for packaging. Glass is FDA approved, entirely recyclable, and will not interfere with the products packaged within. Our French square glass bottles come in 2 oz and 16 oz sizes and could be a stylish choice for packaging many products. The larger necks of these glass bottles are designed to effortlessly dispense products such as smoothies, oils and dressings. The French square bottles have four panels that provide an eye catching area for labels and silk screening to make your product more attractive on store shelves. Pair this bottle design with our black phenolic lined caps to create a high-end appearance and add clear shrink bands for complete tamper evident protection. Marasca square bottles are a taller, more slender variation of the square glass bottle shape. 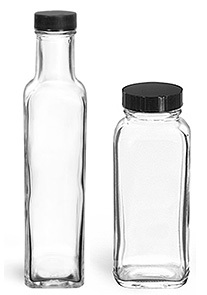 SKS offers these glass bottles in a 250 ml (roughly 8.5 oz) size. Marasca square bottles have smaller neck openings, allowing for a more controlled pour when dispensing products. With a taller height, the Marasca bottles can be used to decoratively layer spices and herbs, or include leafy herbs in oil infusions. Perfume sample square bottles are sold in a 1/4 oz size with your choice of ribbed black plastic caps, black phenolic cone lined caps or bulb glass droppers. 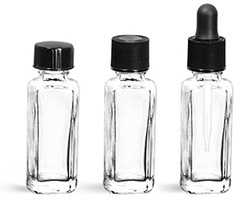 The smaller size of the glass perfume sample bottles accommodates a range of possible applications, including pharmaceutical, aromatherapy and cosmetic. SKS created a custom mold to add clear, amber and white PET square bottles to our broad inventory. The 4 oz clear PET square bottles come with the option of red or black spice caps featuring PS113 liners. The PS113 liner has the words "Sealed for Freshness" printed on it, and adheres to the bottle when the cap is securely screwed on. This combination works well to bottle dry herbs, and to package barbecue rubs, and seasonings. For packaging products such as smoothies and other drinks, choose the 8 oz and 16 oz PET square bottles with white ribbed PE lined caps. For products that may require UV barriers, or if you desire a complementary color for your line, SKS also offers white and amber PET square bottles in 2 oz and 4 oz sizes. The white PET square bottles paired with white child resistant caps are a functional and appealing way to package vitamins, pharmaceuticals, and medicinal remedies. The child resistant caps prevent unwanted opening and the square shapes provide labeling panels for all required notifications as well as eye catching logos and designs. Choose the amber PET square bottles with black smooth caps to create a sleek packaging design for men's products within a full line of body care products. For more packaging ideas, watch our short video on PET square bottles! Whether in glass or plastic, square bottles are a compelling packaging choice for numerous products. Contact our customer service department with any questions you may have!